Can Feeding a Guinea Pig Rabbit Food Make It Sick? Guinea pigs, also known as cavies, are common pets due to their gentle nature and sweet dispositions. Long ago, keeping guinea pigs and rabbits together was common, but the vast differences in these species have made the practice all but obsolete. Among other things, guinea pigs have special dietary needs, different from those of rabbits. Unlike most animals, but just like humans, guinea pigs can't synthesize vitamin C so it must be added to their diets. Guinea pig pellets on the market most often contain vitamin C for these cuddly, tailless rodents. Rabbit pellets don't contain vitamin C, and a vitamin C deficiency could cause serious problems for your cavy. Vitamin C is the No. 1 reason feeding your cavy rabbit pellets is dangerous. Lack of vitamin C can cause scurvy. Symptoms include loss of appetite, stiff joints, bleeding gums and nasal discharge. Scurvy can be fatal in your pig. Although the basic nutritional needs of regular guinea pigs -- those not breeding or used in labs -- have not been studied as much as the needs of other small mammals, in general a guinea pig pellet should contain a crude fiber content of about 10 to 16 percent and a crude protein of 18 to 20 percent. Unlimited amounts of grass or hay such as timothy hay should be available at all times, along with an assortment of certain veggies. Like cavies, rabbits need an unlimited supply of fresh timothy -- or other -- hay. The hay provides roughage among other nutritional benefits. Unlike cavies, though, the nutritional requirements of rabbits are a bit different, as are their pellet formulas. Adult rabbits need a pellet with high crude fiber and a crude protein of less than 10 percent, much different than the pellets fed to guinea pigs. Because the protein in rabbit pellets is so much less, your guinea pig could succumb to malnutrition and a severe lack of energy from protein deficiency. Because pellets make up a decent portion of the guinea pig's diet, exchanging rabbit pellets for them isn't healthy and could potentially cause your cavy harm. Guinea pig pellets are available almost everywhere rabbit pellets are, but if you're having a hard time finding them at your normal shopping location, try big-box stores or a dedicated pet-supply store. Why Do Rabbits' Teeth Never Stop Growing? 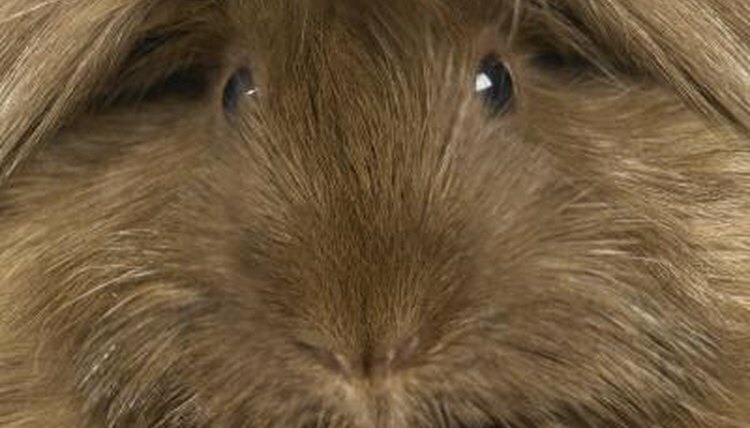 Is Alfalfa OK for Guinea Pigs? What Kind of Nutrition Does a Rabbit Need Daily? How Can I Make Sure My Rabbit Wears Its Teeth Down?